The world we live in is fast paced, cutthroat, and incredibly confusing. We are often forced to make choices we truly aren’t sure about, or weren’t ready to make. We spend our time saying “What if?” or “I shouldn’t have.” We often look out instead of in as we try to find the root of what makes us tick, placing blame on everyone and everything other than ourselves along the way. 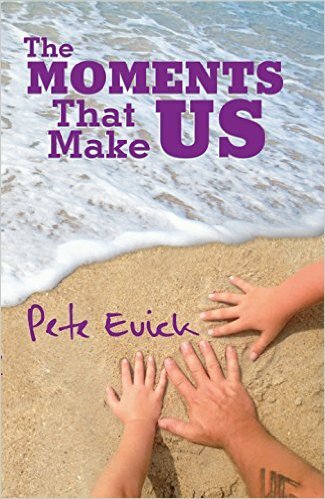 Pete Evick, professional musician, award-winning producer, songwriter, and father, shares his personal stories about the unique moments in his life, in hopes that they will convince you, the readers, to dig a little deeper into your own moments and evoke the mental archaeologist lying dormant in all of us. Given the type of literature that is awash on Amazon and being produced by even trade publishers these past few years, THE MOMENTS THAT MAKE US was both a pleasant surprise and a breath of fresh air in the literary world. Before I get into this review, I must confess I rarely read these days, and certainly not non-fiction. I’ve been following Pete’s career off and on ever since he joined Bret Michaels Band. With that said, I purchased his book because I support both him and his career, regardless of which direction that career goes. Had I never read it, I would have at least contributed to a guitar legend’s newest endeavor, and so I was giving back in some small way to the artistic community. With just the blurb and this one review, I was eager to read this story. Now, I can’t imagine my life without having read this amazing journey of self-discover by not only a rock legend, but a really funny, down-to-earth, and all around amazing guy. The first thing which struck me about this book is Pete’s writing style. It’s personal, narrated as if Pete is sitting down talking to you directly, recounting stories and lessons throughout his life. I was moved to tears on more than one occasion, discovered myself giggling at other times, felt my motherly instincts kick in for a young Pete who was wronged in my eyes so many times. I have never felt so close to another person as I did while reading this book. Growing up, isolated with my own demons to bear, I was never really close to anyone. Reading about this uber famous guitar legend who had some of the same insecurities as me growing up, even some of the same insecurities even now, is a much-needed reminder that, underneath everything, we are all still human. I can’t help but feel if Pete and I had grown up together, we may have become fast friends. Needless to say, I have not only learned a lot about Pete, but also a lot about myself, and also found within his words much needed inspiration in not only my personal life, but in my professional life as well. All in all, I simply cannot say enough good things about this book. If you are looking for something more down to earth, a book which will not only lead you to your own self-discovery, but will also give incredible insight into the mind of a rock legend who considers himself to be just another average Joe, a book written which you can actually relate to and will make you feel better about yourself and the world in which you live in, a book which will make you appreciate the small things in life, then do yourself a favor and pick up Pete Evick’s THE MOMENTS THAT MAKE US. If nothing else, you will find your own little slice of the rainbow, and find it all the more sweeter than you ever imagined.